HMS Daring is on a dangerous mission off the coast of war-torn Yemen protecting one of the world’s busiest shipping routes from terrorists. The ship is operating as part of Combined Task Force 150 and will use its Royal Navy and Royal Marines boarding teams to conduct counter piracy, counter-terrorism and counter-smuggling operations. Its main effort is to disrupt terrorist groups such as Al Qaeda and Al Shabab and deter piracy and other unlawful activities at sea in an area spanning from the Suez Canal, through the Red Sea, Indian Ocean and into the Gulf of Oman. The Portsmouth-based warship is operating in the piracy-hit Bab al-Mandeb strait, which sees a huge amount of global trade passing through it. The Type 45 Destroyer is protecting merchant vessels and other Royal Navy ships with her combination of surveillance radars and Sea Viper missiles. Portsmouth North MP Penny Mordaunt said keeping these routes safe is vital. 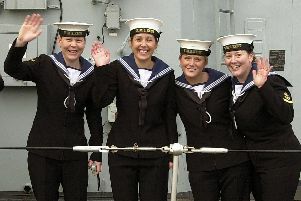 ‘The Royal Navy not only safeguards our freedom, but also our entire way of life,’ she said. ‘Keeping the worlds trade routes open is vital and the contribution the navy makes to that globally cannot be underestimated. Jonathan Roberts, from the UK Chamber of Shipping, said the Royal Navy is the best of the best for giving protection. ‘An island nation needs a strong shipping industry and a strong shipping industry needs military support,’ he said. HMS Daring operates with the Royal Navy’s newest type of helicopter, the Wildcat Mk2, which uses its targeting system and surveillance radar to help reduce the threat of waterborne attack.